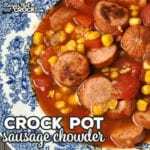 This Crock Pot Sausage Chowder is not only a delicious way to warm up, but it is also a super easy recipe to boot! Win! Win! Lightly brown your sausage in a skillet (or browning slow cooker) and drain. Mix together all of your ingredients in a 6-quart crock pot. Cover and cook on low for 6-8 hours or high for 3-4 hours. Serve with tortilla chips.